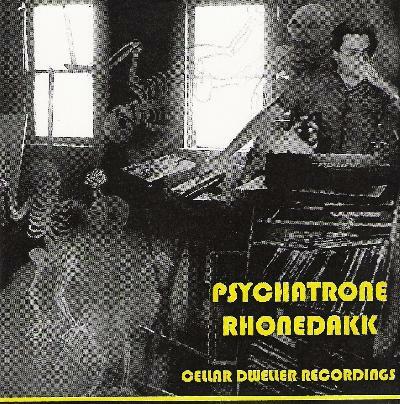 Psychatrone Rhonedakk - "Cellar Dweller Recordings"
Although his first official CD, Keep On Psychedelic Mind came out back in 2001, the mysterious Psychatrone Rhonedakk has been creating strange sounds in his secret laboratory for many a year now. Now and then, some of these early recordings see the light of day, as they have now in Cellar Dweller Recordings. Are these the ravings of a mad scientist or the musings of a cosmic psychedelic explorer? Perhaps a bit of both. Using ancient, analog flea market gear, Psychatrone creates buzzing, squelching, deviant sounds from some other reality. Everything from the 70's sci-fi movie score style meditations of Piece 1 (First Day Korg) and Piece 3 (Sci-Fi Theme) to the frightening, throbbing drum machine madness of Piece No. 5 (Lo-Tech-No) to the lengthy, sludgy noisefest of Bells (one of the definite standouts on the album!). There are a few tracks that are alternate versions of songs from albums already released as well. There's a tasty extended version of Heathaze from Keep On Psychedelic Mind (here called Heathaze Delirium), one of my favourite Psychatrone tracks, and a Cotton Casinoless version of Several Species of Electronic Beings Grooving in Space. And in the tradition of all Psychatrone albums, there's a few unique cover tunes too, including a lullaby version of the Grateful Dead's Mountains of the Moon sung by Psychatrone to his new son! If you're a fan of Psychatrone, this little disc is a must have for your collection, but if you're new, it may not be the ideal place to start. At any rate, you can hear some of Psychatrone's music at his myspace site and then let your psychedelic senses guide you! For more information you can visit the Psychatrone Rhonedakk web site at: http://www.myspace.com/psychatrone.